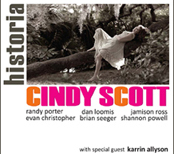 Cindy Scott first got our attention with her “Let The Devil Take Tomorrow” release in 2010. On her new CD ”Historia”, she appears in great form and with an amazing list of musicians. “Historia” is a collection of standards and originals that show Cindy's amazing range as a vocalist, as well as her scope as a producer. The band is simply amazing as is the production. Cindy's vocals are captivating, original, and heartfelt. We're talking world class! There is just such a scope to this record that it is really hard to describe it and do it justice. The tunes just have to be heard. One of my favorites is “Turnaround” on which Cindy shares the spotlight with guest jazz vocalist Karrin Allyson. “Historia de un Amor” is a very heartfelt ballad on which the vocals flow effortlessly between English and Spanish and is accentuated by an amazing guitar lead. The rest of the album is just as stellar. It is a great presentation of Cindy and friends at their best! Highly recommended, 5 out of 5!! !